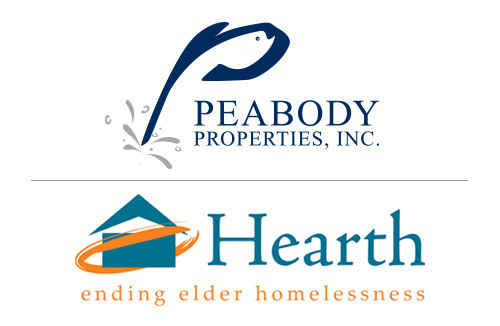 Peabody Properties announced that it has assumed management of five apartment communities for formerly homeless seniors in Brookline, Jamaica Plain, Roxbury and Boston’s South End, as part of an expanded partnership with Hearth, Inc. Since 2012, Peabody Properties has partnered with Hearth – a non-profit organization dedicated to the elimination of homelessness among seniors through prevention, placement and service-enriched affordable housing programs – to help seniors in need find and thrive in homes of their own. Given the success of their initial partnership at Hearth at Olmsted Green in Dorchester, Peabody Properties has assumed management of an additional 118 units of Hearth housing at the Ruth Cowin House in Brookline, Elsie Frank House and Hearth at Burroughs Street in Jamaica Plain, Anna Bissonnette House in the South End and Ruggles Assisted Living in Roxbury. Peabody Properties and Hearth now share a portfolio of 176 units. A leader in the field for 24 years, Hearth provides a holistic approach to resident care with on-site nurses, social workers and certified home health aides, who work together to address residents’ physical, behavioral and social needs. Managerial services provided by Peabody Properties include maintenance of the grounds and properties, oversight of financial operations and assistance in capital improvement.